On 11th February 2014, we have an excellent external trainer coming to the University to run an afternoon workshop for research students. Hugh Kearns is a lecturer and researcher at Flinders University, Adelaide, Australia, and regularly lectures at universities across the world, including Oxford, Harvard and Stanford. We are fortunate enough to have been able to book him! 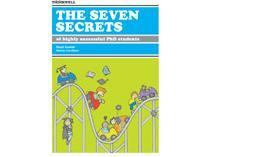 From 13:30-16:30 Hugh will be running “The Seven Secrets of Successful Research Students“. This workshop describes the key habits that Hugh’s research and experience with thousands of students shows will make a difference to how quickly and easily students complete a research degree. Just as importantly, these habits can greatly reduce the stress and increase the pleasure involved in completing. Hugh is widely recognised for his ability to take the latest research in psychology and education and apply it to high-performing people and groups. Hugh Kearns has published a number of books on the subject of completing a doctorate. You can learn more about Hugh Kearns at his Website. Posted on November 12, 2013, in Events, Workshops & Training and tagged generic training, Hugh Kearns, research students, seven secrets, Workshops. Bookmark the permalink. Leave a comment.